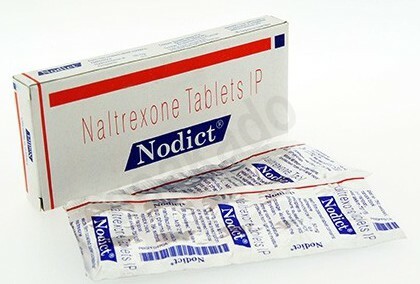 Buy Nodict 50mg (Naltrexone) Generic for Revia. Online Order. – Preventing the pharmacological effects of exogenous opioids and maintaining a clear opioid state in patients with opioid dependence. Complex treatment of alcohol dependence. Positive test for the presence of opioids in the urine. Breastfeeding (at the time of treatment is excluded). Children and adolescence (up to 18 years). You can try to use another generic version of Revia (Naltrexone)under brand name: Naltima. The drug is prescribed only after relief of the withdrawal syndrome and after a preliminary detoxification. The use of naltrexone is started in specialized drug treatment departments 7-10 days after the last intake of the opioid drug. In the future, the patient must be under strict medical supervision, a positive attitude is necessary for the treatment of drug addiction in the patient. Treatment of alcoholism: Inside to 50 mg once a day, a 12-week course of treatment prevents relapse within 6 months (the success of treatment depends on the patient’s consent). 50 mg every weekday and 100 mg on a Saturday. 100 mg every other day. 150 mg in 2 days. 100 mg (on Monday), 100 mg (on Wednesday) and 150 mg (on Friday). It should be borne in mind that the use of these regimens increases the risk of hepatotoxicity. The course of treatment is determined individually. From the nervous system: and the sense organs More often – extraordinary fatigue. Rarely, the vagueness of visual perception, confusion, hallucinations, central nervous system depression, ringing and feeling of stuffiness in the ears, pain and burning sensation in the eyes, photophobia, irritability, drowsiness, disorientation in time and space. On the part of the respiratory system: Rarely – hoarseness, nasal congestion (hyperemia of the vessels of the nasal cavity), sneezing, shortness of breath, dryness in the throat, increased separation of mucous sputum, sinusitis. From the cardiovascular system: Rarely – chest pain, nonspecific changes in the ECG. From the genitourinary system: Discomfort with urination, increased frequency of urination. Allergic reactions: Less often – skin rash. Rarely – hyperthermia, skin itching, increased secretion of sebaceous glands. Other: Rare – thirst, increase or loss of body weight, pain in the groin, lymphadenopathy, lymphocytosis. In one case, the development of idiopathic thrombocytopenic purpura is described against a background of preliminary sensitization to the drug. Opioid withdrawal syndrome: Abdominal pain, epigastric cramps, anxiety, nervousness, fatigue, irritability, diarrhea, tachycardia, hyperthermia, rhinorrhea, sneezing, goosebumps, sweating, yawning, arthralgia, myalgia, anorexia, nausea and / or Vomiting, tremors, general weakness.